NEW YORK (CNNMoney.com) -- Despite a very vocal group of detractors, the vast majority of iPhone users love AT&T. The results are surprising, given the pounding AT&T has taken in the media and on the blogosphere about its service-related issues with the iPhone. On CNNMoney's recent stories "AT&T and Apple's marriage made in hell," and "AT&T: The most hated company in iPhone land," reader comments were overwhelmingly negative toward the wireless network. AT&T's recent iPad-related security glitch and mishandling of the iPhone 4 launch likely didn't do much to help its reputation. Plus, iPhone owners pay AT&T nearly $12 a month more for service than the average smartphone user. 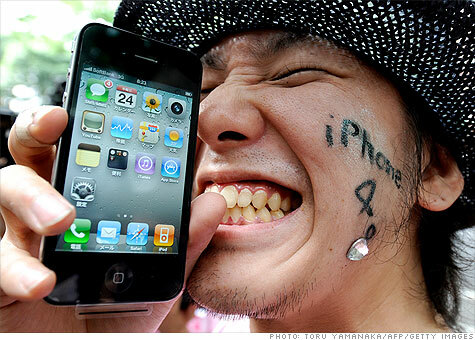 Tech analysts like to point out the ways in which AT&T is a drag on the iPhone. Gartner Research Director Carolina Milanesi said last month that AT&T's network has "limited the iPhone experience." And Drake Johnstone, an analyst with Davenport & Co., forecasted that poor experiences with AT&T would drive as many as 40% of iPhone customers to Verizon once that network gets the iPhone. So what explains Yankee Group's conclusion that iPhone users' love AT&T? "Consumers transfer the high gloss of their Apple iPhone experience to AT&T," says Carl Howe, Yankee Group analyst and author of the study. "The iPhone creates a halo effect that rubs off." In other words, iPhone customers' praise for their network may be a result of the famous "reality distortion field" that surrounds Apple (AAPL, Fortune 500) CEO Steve Jobs and his company's products. But AT&T says its network really isn't as bad as many people think. It's a perception problem, not a service problem, in the company's eyes. "There's a gap between what people hear about us and what their experience is with us. We think that gap is beginning to close," says Mark Siegel, an AT&T spokesman. "It doesn't mean we're perfect; we still have work to do. But that's no surprise to us, because we have a great network." Meanwhile, AT&T (T, Fortune 500) continues to reap the rewards of being the country's exclusive iPhone provider. Despite heavy data demands that drive up AT&T's cost of servicing each customer, users still make the wireless company $50 more per customer each year than other providers get from their smartphone subscribers, according to Yankee Group. That's because a higher percentage of iPhone customers buy pricey, top-tier service plans to satisfy their mobile download demands. The iPhone will be worth $1.8 billion in sales to AT&T this year, and will generate $9 billion in revenue for the provider over the next five years, the study estimates. Yankee Group says that's $750 million more each year than AT&T would be taking in if it had a different flagship smartphone. "Our analysis explains why AT&T has bent over backward to keep its exclusive distribution deal with Apple as long as possible," Howe says. "Verizon has been regretting turning away Apple for the last three years." Correction: An earlier version of this story incorrectly said that 20% of Android customers say they'll buy another Android phone. The survey actually revealed that 20% of all smartphone customers say they'll buy an Android phone.